Trees have to be pruned to keep branches and other vegetation from interfering with power lines and equipment. The Electricity (Hazards from Trees) Regulations 2003 sets out minimum distances allowed between trees and power lines. The distances vary according to the voltage of the line. Trees that have grown into overhead power lines must only be dealt with by approved tree clearance contractors. The potential danger to life and property in these situations is very real. In addition, simply cutting or topping these trees is inappropriate because it can cause structural issues within the tree which can create more worry in the future. And because the inconvenience of a power disruption could cause distress to affected properties in the vicinity, it’s important these trees receive prompt care and attention from real experts. Treetech are approved contractors for clearing trees from power lines. We have the necessary equipment specific to jobs of this nature, are WorkSafe compliant for health and safety and have full professional indemnity insurance cover. This means that we can be trusted when it comes to the proper reduction and shaping of trees in power lines. We also operate an emergency callout service should any trees need urgent clearance from power lines as a result of high winds, snow or a storm. 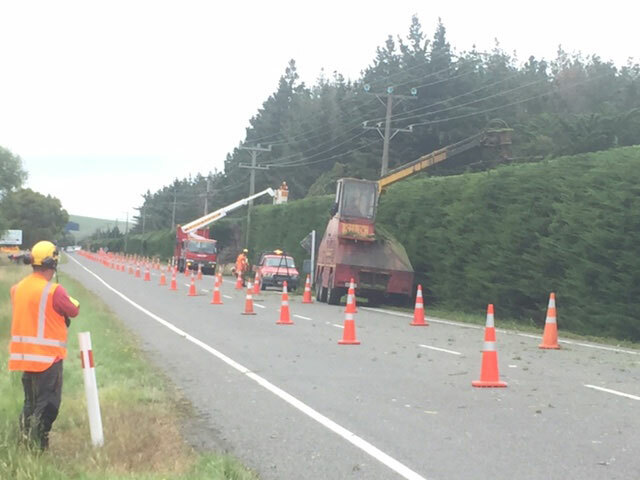 Whether the trees are in power lines on a residential street, commercial development or a remote rural area, our professional crews can ensure the clearance work is done safely and efficiently. Contact us today to keep your power lines clear.